VideoSolo Video Converter Ultimate allows you to convert almost all existing formats, including AVI, FLV, MP4, M4V, MKV, MOV, 3GP, 3G2, SWF, WMV, ASF, AAC, AC3, AIFF, FLAC, M4A, MP3, OGG, WAV, WMA and many more. In addition, it supports HD/4K UHD and 3D conversion. You can take full control of the conversion of 4K (UHD), 1080P (FHD), 720P (HD) and 480P(SD). Better yet, you can rip homemade DVD to MP4. 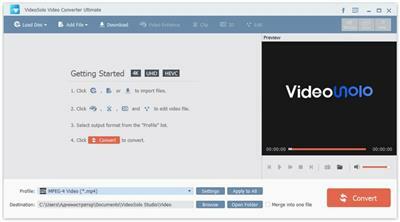 One-stop tool to convert, download, edit and enhance videos. * Convert videos/audios to iPhone, iPad, iTunes, Samsung, PS4, Xbox, Smart TV, etc.